I am having some computer issues - YUCK - so today my Son-in-law will be taking my PC apart and making it "all better". 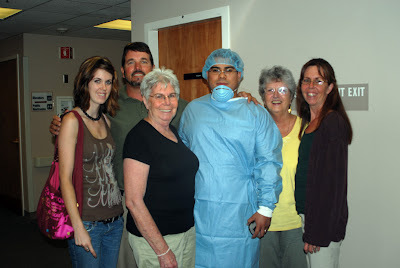 I am not sure how long I will be away, but I will be back soon! I spent most of last night and this morning backing up all of my files and photos so that I wont lose anything important. I hope you all have a GREAT holiday weekend! It's Offically Christmas. . .
at my house that is! Tonight I started on some of my homemade Christmas gifts (and even bought one of my purchased gifts)! I love to make homemade gifts, but the secret to making them is to get a good head start! No one has time at Christmas to be making gifts. I started to take some photos of my creations tonight to share with all of you, but then I realized some of you may actually be receiving some of these, and I didn't want to ruin the surprise! I really wanted to let you know that I started my gifts and encourage you all to try to make some of your gifts this year. They really make the reciever feel special and you have such a sense of pride and accomplishment when you give them! When my daughters were young I didn't give them money to buy gifts. I required them to make their gifts for their grandparents, aunts, uncles and cousins. 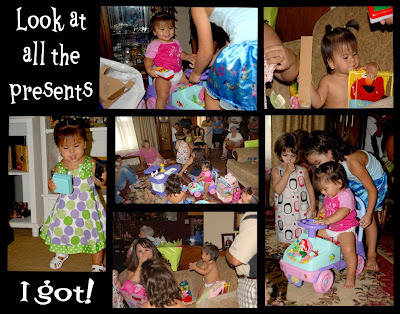 They really had fun doing it and they loved giving their gifts! I am so glad I did that. They learned alot and had fun along the way! Yep, we've done it again! 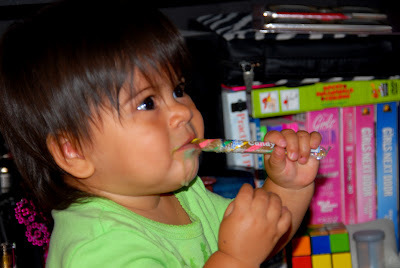 Today Monkey was in Auntie Liz's room and she found old fashion candy sticks from Disneyland on Auntie's bookshelf. Of course Liz didn't tell her no and let her have one. She was LOVIN' It! Until I took it away from her - that little stunt went over like a lead balloon!!!!!!! But before I took it I of course ran and got the camera - had to have a picture of this sweet & sticky adventure! I hope you have found something sweet to endulge in today!!!! Make sure to take a picture of what you did. 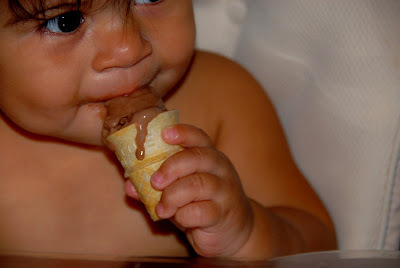 So, the other day it was chocolate ice cream cones. . .
Monkey had her 1st official playdate with our friend and neighbor Kenzie. Auntie Liz went and got Starbucks for herself and Kenzie's Mom. Kenzie wanted one too and there is no way there could be 3 drinks with whipped cream and straws in teh room and Monkey not get one! So Auntie liz whipped her up a special drink of milk, bananas and strawberries while she was there. 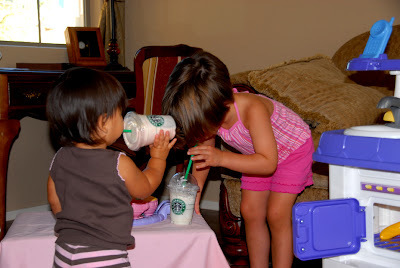 The girls looked so cute playing "kitchen" and drinking their starbucks. By the time they were done playing it was nap time for them both - playing "kitchen" is exhausting!!!! 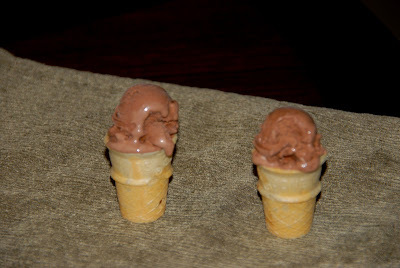 Every day I treat myself to at least one chocolate ice cream cone - sometimes two! I have been waiting for the time when Bryanna gave me the go ahead for Monkey to have ice cream with me. 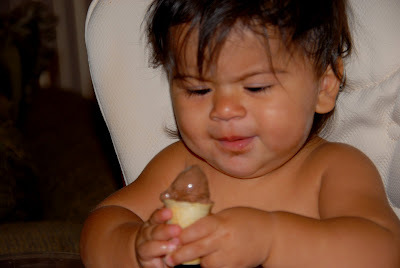 Today she got to have her 1st ice cream cone! After months of watching me eat one everyday, she knew exactly what to do with it when I handed it to her. And she made short work of the tastey treat! Of course I joined her as she experienced this first delicious culinary delight. 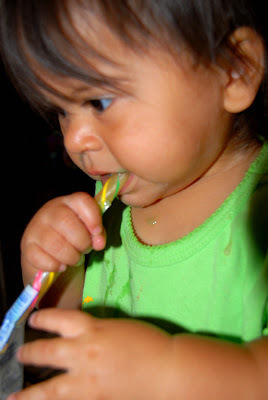 I also made sure my camera was loaded and ready to capture every moment of this monumental part of her young life! I found these mini cones at the grocery store. I have to use a portion scoop (a little bigger than a melon baller) to fill them. They are the perfect size for her small hands. No coaching needed - she knew exactly what to do with this! Not wanting to miss out on any part of that last bite - she shoves it all the way in! It was time for bath #2 in less than 30 minutes now! Mom went ahead and bathed her BEFORE the ice cream cone even though I told her I was going to bathe her AFTER the ice cream! Oh Well. 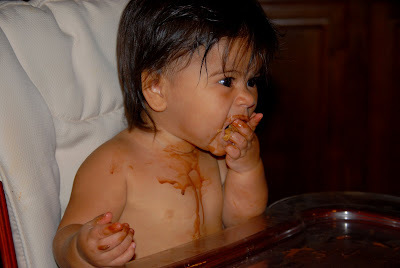 All I can say is "That's the way to enjoy chocolate"!!!!!!!! I hope you found something to endulge in today! I have updated the list of classes I will be teaching at the Creative Quest. Y0u can see them in the column to the left. I hope I will get to see you in one or two or all of them! To sign up just call the store (623.847.2215) or drop by, the gals there will be glad to get you registered. You can see the class sample in person at the store when you stop in. I hope you all had a great week! 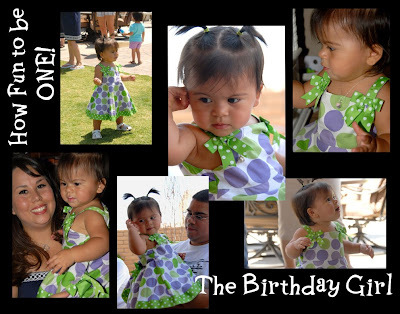 Well it is Tuesday morning (2am)and I am just getting the chance to share some pictures of Monkey's 1st birthday! It has been a CRAZY weekend!!!!! The party was a big success! She had a blast and was so very good! She just loved having all of the kids over to play. She was not thrilled with the cake part though. She just didn't "get it". 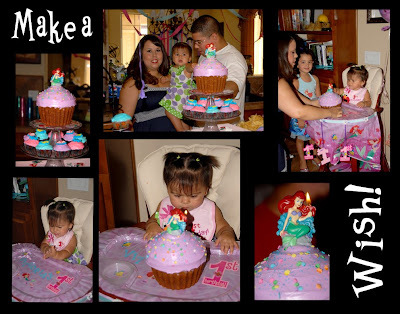 No tears when we sang to her, but she would not even touch the cake! Bryanna tried putting her hands in it to show her she could just dig in. But that was not happening, she just tried to "wash it off" You can see her trying to do that in one of the photos below. She was so cute while Bryanna opened her presents for her. She would say "Elmo" after almost everyone. 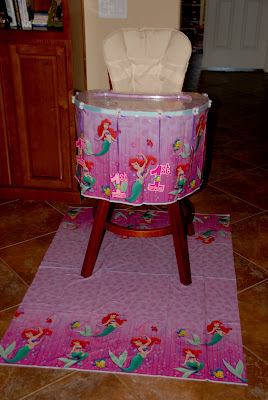 The big hit of the day was the Little Mermaid car that Auntie Liz got her! She was all over the place in that thing with a huge grin on her face. The gift that was the big hit for her Mommy was the Tiffany cupcake necklace. This is this one year old's 3rd Tiffany! We were all beat after the party and all took turns taking a nap. But Sunday was the day to get busy! It was time to start packing and getting things ready for Monkey's birthday trip to California. 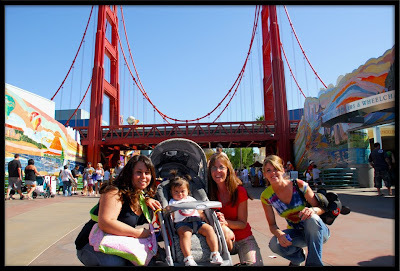 Just us girls are leaving at 11am today for Disneyland! The guys will meet us in San Diego on Thursday night. We will be heading to the beach at Coronado Island and having another birthday at Poway park with Darwin's family while we are there. I plan on taking LOT's of pictures while we are away! Well, I guess I should head to bed now, but I just couldn't leave without sharing some pictures from Monkey's party! 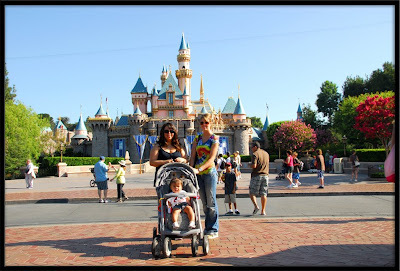 I will be back Sunday night and will try to share some pictures early on in the week of our trip to Disneyland, the beach and the party. I hope you all have a fantastic week! A Time For Reflection. . . Tomorrow is My Monkey's FIRST BIRTHDAY!!!!! How can that be? So after a long day of cleaning and decorating I need to reflect. . . reflect on all of the joy I have had this past year. One year ago tonight I was sitting in a hospital room with my daughter and son-in-law awaiting the arrival of my first grandchild. One year ago tonight I was excited and a little worried. One year ago tonight I never went to bed and wasn't tired. 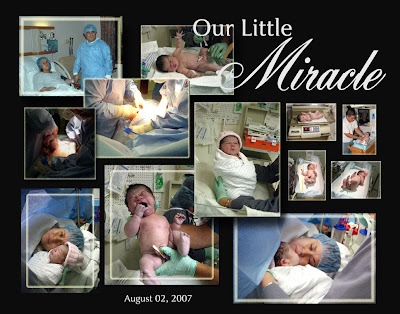 The next evening I held that perfect baby girl in my arms and I loved her instantly! Even I was surprised at the amount of emotion I felt that evening. The past 365 days have been one adventure after another, and I am so blessed that I got to be a part of all of them! There was the . . . 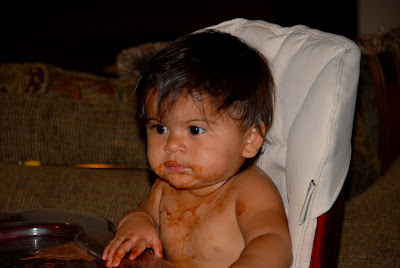 Tomorrow My Monkey will be sitting in this chair eating (or at least destroying) her very first birthday cake. Tomorrow there will be about 50 people in my house all celebrating the life and joy of Vittoria Lee! I hope you all have a special day tomorrow too! 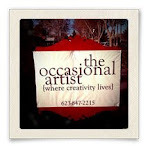 The Occasional Artist, where I teach & Shop! Be sure to visit The Occasional Artist either online or in person. Tell them Marta Sent you. See you there! You Can Follow The Beenz Too! All content, including text, photographs and designs are © Garbonzobeenzdezignz. I share it with you for personal inspiration and it may not be copied for publications, taught as classes or duplicated in anyway. I have granted permission to other blogs to share quotes and photos from my posts, but would ask that you get in touch with me before doing so. Hey, where ya going? There's more to look at. Keep going!